Look out, Pascagoula, I’m signing at the Zonta Arts & Crafts Festival on Saturday, October 1st. This is my first festival so I’m ready for everything, except rain. I’m supposed to have a booth on the north side at 711 Delmas Avenue, south about 2 blocks from my old home at 711 Krebs Avenue. That gives me a warm and fuzzy feeling of being back home. 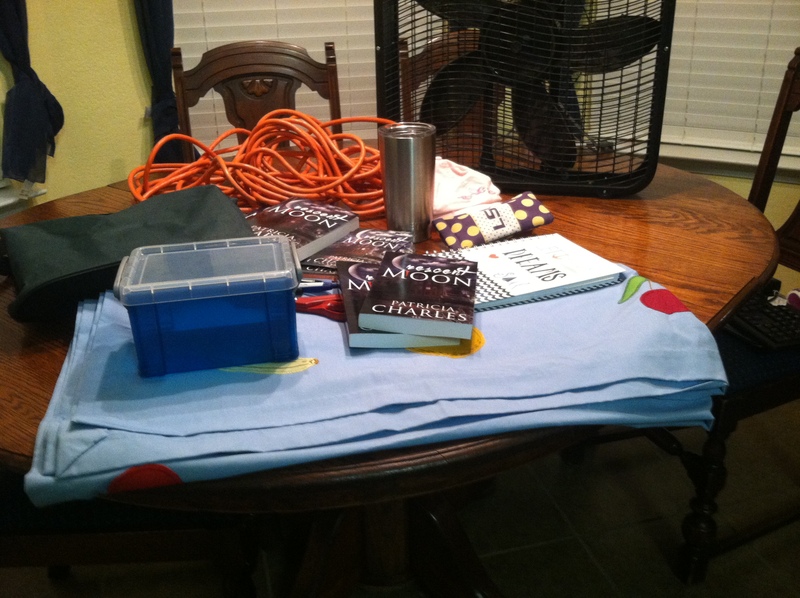 As you can see by the picture, I have my books, my grandmother’s handmade tablecloth, electrical cord, fan (I don’t do heat and I live in South Mississippi), scissors, box for drawing for a $15 Amazon gift card, lip gloss, hat, sunglasses, Yeti, pens and a notebook in case I have time to write. Did I forget anything? Whether you are a reader or not, I hope all my old friends and new ones will stop by and say hi. Please share, call, knock on doors, whatever to spread the word. See you Saturday! He sat in the hard wooden chair at the end of the table, like a corporate giant ruling his boardroom. Crossing one leg over the other, he rested his ankle on his knee and his Stetson on the table. His long legs appeared to go on forever. Morgan was tall—perhaps six foot four. Celine St. Pierre had been short. Claressa made a mental note to check with forensics. The angle of the impact could be another strike for the prosecution. “But you were in her house on November 21.” Claressa scrutinized his face. The day-old beard. The haggard, rebellious look. She knew he’d been there. She had no doubt at all. “I think that’s enough. My client has no more to say.” Like rotating apes on a carousel, it was Matthew’s turn to speak. Why? She wanted to badger West Morgan until he spilled the truth. She knew how, what, where, and who. All she needed was why. What was his motive?